Feeling the Pressures of Production? Take your time and be patient with yourself. 1. 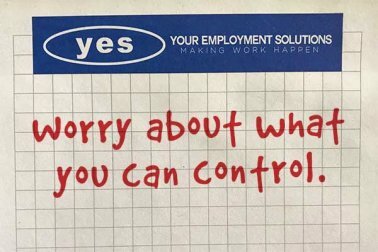 Worry About What’s in Your Control. The list can go on, and on. Just slow down and focus on what YOU can control. Essentially, it comes down to 2 things: your attitude towards the job and your attendance. 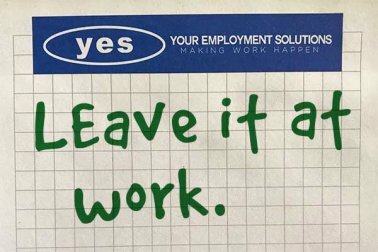 Even if you’re an amazing worker WHEN you’re at work, if your attendance is terrible… you won’t be there long. Then, make sure you are happy to be at work and take on additional training/criticisms with a good attitude. Use it to make yourself better. It’s very easy to look at everyone, even those starting with you, and say “I wish I was as fast as them.” or, “Why am I not catching on as quick as them?” Don’t do that to yourself. I have seen people succeed in the first week and others that took a month or so to get something down, but the DID get it down. Understand that there is a learning curve and you need to only worry about how YOU are handling that curve. Frustration, stress, and fatigue will all play into that. Expect them to. It’s a new job and you’re learning new things. As they say, “when life gives you lemons, make lemonade”. Unless you don’t like lemonade, then make something else, there is a lot you can do with lemons. The best part is, IT’S UP TO YOU!! The best thing (in my opinion) that you can do is get with your Supervisor and see where you’re succeeding, as well as where you’re lacking. Try to make a game plan on how to best handle those struggles and push forward. Remember, you can only worry about yourself. Don’t EVER worry about anyone else. 3. Don’t Bring it Home With You. Out of the 3 suggestions I’ll give you, this one means the most to me. There is a reason you have a shift, don’t bring the pressures home on your off-hours. Enjoy time with your family. Go do something to help clear your head. Whatever helps you relax an unwind. Some people like going outside and shooting a ball around. Some like to play video games while others maybe prefer a hike. Or, if you’re name is Eric Nelson, you might prefer to run to St. George, Utah and back just for kicks and giggles. The nice thing is that you control what you get to do in those moments. Take advantage of that time and make sure you know the #1 rule of personal time: DON’T THINK ABOUT WORK. Everyone needs that time away. Know that you’re not alone. When you’re at work you have a team at your back that wants to help you succeed and cares about you as a person. Use that team to the best of your abilities. Understand that people have bad days, so if you happen to work with someone that’s experiencing one, make sure you help them out and be there for them. As you all know, a chain is only as strong as it’s weakest link. 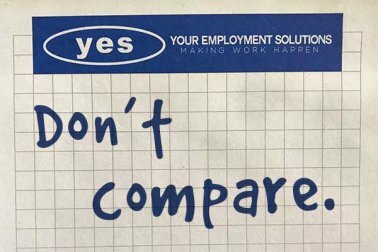 Remember to worry about what’s in YOUR control, avoid comparisons, and don’t bring work home with you. All-in-all, that will make your job that much more enjoyable. Chris is an on-site manager at Your Employment Solutions where he helps staff current openings for one of our Salt Lake area clients and works to provide superior customer service.